At Arrow Media Services we take pride in authoring DCPs that look great, sound great, and are as compatible as possible with all Digital Cinema systems. Whether you’re an indie filmmaker hitting the festival circuit, a distributor planning for theatrical release, or creative agency delivering short form content, you can trust us to give your project that extra level of attention that all the “DCP mills” don’t. We also offer some of the best pricing you’ll find! Use our detailed price calculator below to get an accurate quote for your project. Need something special or not listed? Are you new to DCP creation? No problem — We get it all the time and we’re here to answer questions or help with anything. A DCP is a collection of media files specially encoded and packaged to adhere to the strict guidelines set forth by Digital Cinema Initiatives (DCI), and is most commonly used for theatrical exhibition of films. The industry standard is to deliver the files on a specially formatted hard drive loaded into a metal caddy (the CRU-DataPort DX115), designed to be inserted into the theater’s cinema server. 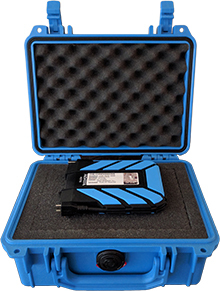 However, with the maturation of digital cinema technology most theaters no longer require bulky CRU drives and can just as easily accept portable USB drives (with some caveats). If you want to learn more or if you aren’t sure what to enter in the calculator there are some tips and helpful links below it, or feel free to contact us anytime. How many drives should I order? : A good rule of thumb is to order 1 drive for every 3 festivals your film is playing, as long as there is enough time between festivals for the drives to be trafficked between them. What kind of drives? : We recommend having at least one CRU drive in circulation in case a theater or festival requires it — For the others, a Rugged drive will suffice and save costs. Should I encrypt them? : If you have a super high profile film you might want to consider it, but in general it’s never required and is usually discouraged by festivals. How many drives should I order? : You’re probably going to need one DCP copy for each theater, although many theaters are willing to screen from Blu-Ray if you need to save on costs. What formats? : Most commercial theaters prefer (and some require) CRU drives. That said, if you’re doing a small limited theatrical run on a very tight budget you can check with some of the theaters if they’ll accept a Blu-Ray source instead. Should I encrypt it? : If you can afford the extra cost our advice is yes, you should. When we create an encrypted DCP it can only be unlocked and played by a system that has been given a special key, called a KDM, beforehand. These requests take time to process and sometimes require additional support, so we charge an industry standard fee per KDM request ($15). We can also create encrypted DCPs from existing unencrypted ones or vice versa (repackage) for a flat rate of $250. Below are some informative links if you’re interested in learning more about Digital Cinema and DCP.